We are hot off the heels of our Dell S2719DM review and on to another Dell monitor review. 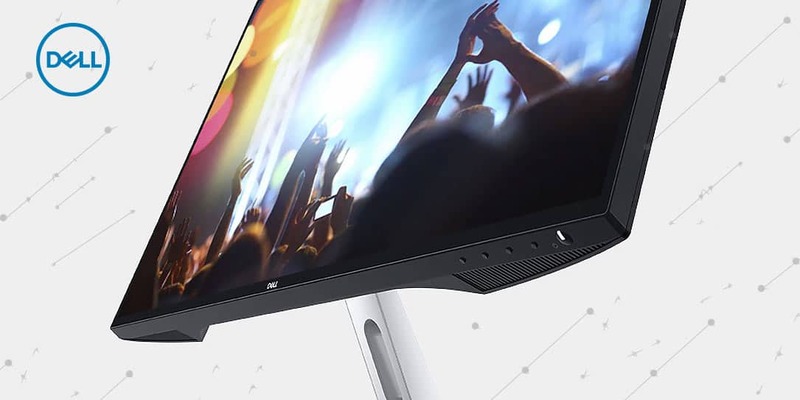 This time Dell sent us the Dell S2719H full HD monitor with integrated speakers. While it’s a little lower resolution than the S2719DM, it’s also a little bit friendlier on the wallet. Wallet savings is one thing but can the Dell S2719H deliver value for that lower price? Read on for the full Dell S2719H review! Dell’s monitor designs are all pretty inline amongst all basic models. The Dell S2719H has the same super-thin bezels and small Dell logo at the bottom as even the more expensive models. There is a difference in build materials as the stand here is made of plastic covered metal. More expensive models are made of aluminum. The back of the monitor is shiny black plastic and the Dell logo is there as one would expect. Another huge difference here is the location of the input/output ports. The I/O isn’t as easily accessible as the previous S2719DM I reviewed last week. 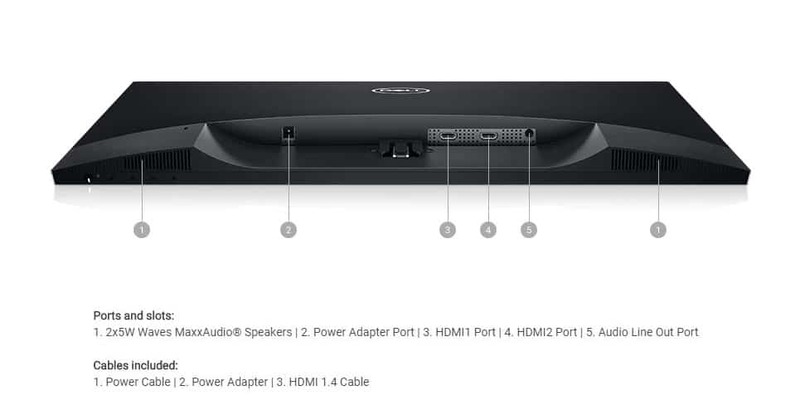 The I/O (2 HDMI-in 1.4, power port, and an AUX port) location is more typical of what you normally find on monitors, tucked under a lip which isn’t convenient at all. Even with the lower grade materials used on the S2719H, it still weighs about the same as more expensive models at 17.33lbs. Even though that seems heavy, it’s still not difficult to move around if need be. As with many of Dell’s other models, the adjustment buttons are along the bottom right of the monitor. Engaging with these will allow you to make granular adjustments to colors, brightness, presets and more. Along the bottom are the integrated speakers, more on that later. Dell’s monitor designs are all pretty inline amongst all basic models. Again, the main complaint with modern monitors, in general, is the lack of height adjustability. The Dell S2719H has a nice tilt adjustment but totally lacks the height adjustment some may really want. There is also no VESA mount option here either, so it’s the stand or nothing. Overall, the design and looks are average here. You’ll have to step up to something like the S2719DM if you want something sleeker looking and more modern looking. My only real complaint, which goes the same for the S2719DM, is that lack of height adjustability. 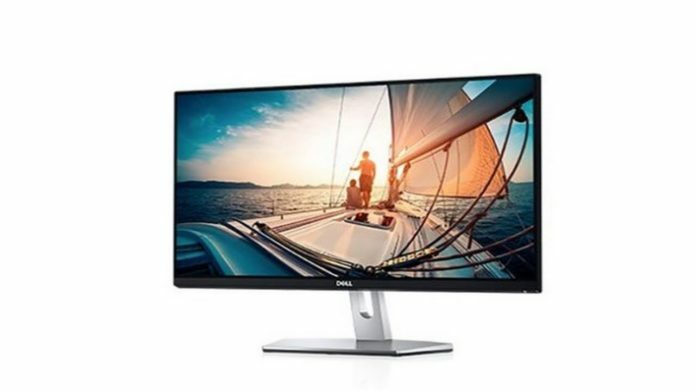 The Dell S2719H has a full HD display with a resolution of 1920 x 1080 at 60Hz. Those numbers should be decent enough for everyday use for most users. Obviously, if you’re a creative using Adobe CC or other software, you’re going to want at least a 2K display, so I wouldn’t consider the S2719H a display made for creative pros. I do really appreciate that Dell includes the InfinityEdge look even on this lower resolution model. Dell says this panel has a greater than 99% sRGB color coverage and colors are very nice here. 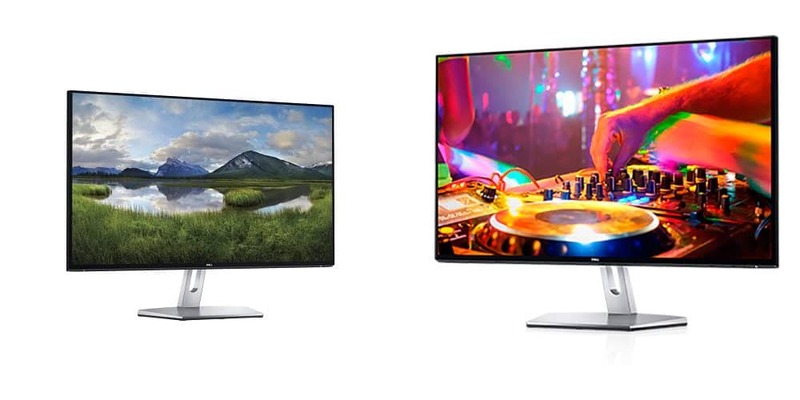 Given that the S2719H has a lower pixel density when compared to its bigger brothers, you can tell a subtle difference in color. Don’t get me wrong, the colors are great here, but after reviewing the 2K model, they left me wanting. You should be fine if you’re just looking for a 1080p display and don’t use anything else. Whites are decent, not as clean as other monitors but not bad at all. Blacks are good, deep but could be deeper, but again, consider the price. Brightness is good, we couldn’t find the nits rating for this panel but the levels are acceptable. Overall, this is a very nice panel for everyday use and even for productivity. If you’re looking to do photo and video editing then I’d recommend looking at Dell’s 2K options. The extra pixels are just worth it if you’re doing that kind of work. This monitor does have built-in Dell CinemaSound 5W speakers. The sound isn’t the best but it’s not the worst either. The speakers are suitable for watching YouTube and other media but certainly not an immersive experience for gaming or movie watching. Overall, they’ll work just fine for most but they’re not a serious sound contender. The “market value” of the Dell S2719H is $329.99USD and Dell has it on their website for $237.49USD. If you’re thinking of heading over to Amazon for a purchase, the price there is slightly higher at $268.98USD. There are other brands you could buy that are cheaper but the Dell does have quality craftsmanship and nice design which you should consider.